The up and coming band from Iran, AHOORA, brings out their newest release, “Awkward Diary,” amongst seemingly endless turmoil in their own country. Their indie metal musings have developed from years of struggle, and the loss of a dear friend in the June massacres. As guitarist Milad Tangshir declares, “we sit where Muse meets Iced Earth,” and seven years of playing together has developed AHOORA into a melodically wandering, yet precisely heavy group. Tangshir shares some comments and thoughts about the national metal scene as well as the development of his Iranian forbidden band. Maximum Ink: As simply as possible, how would define the sound of AHOORA? 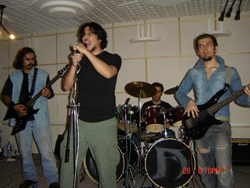 Tangshir: We’re an indie rock/metal band from Iran. You could say throughout the years we’ve mixed aspects of Prog/thrash metal with alternative modern rock. Maximum Ink: Define, if you can, the sound on “Awkward Diary”? Tangshir: I think “Awkward Diary” is a multi-genre album; and definitely the most original one. It includes different modes and atmospheres; a modern rock album I’d say. Maximum Ink: How do you feel it is different/same as previous musical releases that you’ve had? Tangshir: It’s different in many ways. First, I think we’ve been successful in closing the gap in quality terms. This record has a better sound and a better quality to listen to. We were never optimistic to make it here in Iran. Also in terms of genre this is a obviously a different album. Our last album “All In Blood With You” was more of a progressive thrash metal record; which were mentioned close to Nevermore and Coroner. But this time you should expect more multi-genre album which targets more and different audience. I think with “Awkward Diary” Ahoora can adapt better with the year its living in. the unchanged thing is, it’ll surprise you how we’ve managed to improve in compare to our last album. Maximum Ink: Who are your influences musically? Tangshir: There are many different bands that we love and are influenced by, but to mention a few: Muse, Iced Earth, Black Sabbath, Pink Floyd, Nevermore, Coroner, and Porcupine Tree. Maximum Ink: Does where you come from affect your music? Do you feel your culture/heritage/surroundings have affected your music, and how? first single “Crimson Baby” is about and dedicated to Neda and all who died innocently in Tehran streets during the conflicts of June 2009; Let me tell you that these past few days were the most brutal ones since the June massacre. Maximum Ink: Do you find these kind of politics affecting your music? Tangshir: Yes, anyway we’re getting up every morning in this attitude and situation. Everything you do is somehow affected. Not us, but everything everybody does in their daily life, is affected deeply; and so our album. Maximum Ink: Where does inspiration for your music come from? What drives the content of your music? Tangshir: In “Awkward Diary” I tried to do something simple that was missing in our previous albums: Writing about my daily thoughts and feelings. It was a simple and important tip by Jon Schaffer of Iced Earth. I think the most inspiration was the modes and stages that I/We were going through in almost a year. You can see now why it’s called “Awkward Diary”. Maximum Ink: What does playing live/music scene mean to you? Do you feel you are a studio band or a live band? Or both? Tangshir: Very important question! Unfortunately I can only see us as a studio band for now. It’s my dream to be both, and be able to tour like many musicians and bands. The first reason is that we can never perform in our own country. We’ve had a concert in 2005 in Tehran but since then we were banned. So throughout the years we’ve turned into a studio band. But let me tell you that our most important goal for 2010 is to book some gigs out of Iran. Already late, but that’s going to be our next step. Maximum Ink: What are your opinions on the current metal/hard rock scene worldwide? Locally for you? Where do you think this music is going? Tangshir: I think the metal bands should keep up to the time and age they’re living. Attitude-wise and musically both. I think the music should respond to the listener by all means. Variety of sounds, modes and themes are something that your ear demands in 2010! I think they shouldn’t be stuck in genre limits which were set in a different time and situation. In my country there’s a no real scene. Some years ago we had lots of hard rock and heavy metal bands, but most of them have faded due to “no chance, so why bother” situation. Maximum Ink: What are some of the big difficulties as a group that you have overcome/ing? Tangshir: There have been some! But one of the hardest moments was when 24 hours before our show the gig was devastated by authorities. It was September 2006 and we had practiced 60 days in the most horrible and unimaginable situation for this concert, which was going to be our 2nd. But became the second devastated one! We’ve never performed since.